When you purchase a sofa, you want the most comfortable one you can find for your money. A comfortable sofa allows you to spend many hours relaxing with your family. Look for a sofa that suits your lifestyle as well as your interior décor. Pick a sofa appropriately sized for your living space, so you can enjoy its comfort without bumping into bulky seating as you pass by. A comfortable sofa provides adequate support at the back and seat. Even though you don't see the sofa's structure, it forms the basis of how comfortable the sofa is for the user. A comfortable sofa has a frame designed in such a way that it's easy to get up and down from the seated position. The frame needs to be sturdy enough to support the weight of several people. Look for sofa frames constructed of hardwood, such as kiln-dried ash, oak or beech. Examine the legs of the sofa. They should either be part of the frame itself or attached with dowels or screws. If you raise one of the front corners of a sofa, the other front leg should come off the floor as well, if the sofa has a solid structure. If the other leg doesn't rise from the floor, the sofa is structurally weak and may not be comfortable over time. The padding on the sofa is probably the first thing that comes to mind when you think of how comfortable a sofa is. High-resilient foam is a good choice. There are various types of fiberfill used in sofas, but some types quickly pack down and become uncomfortable. Goose down, the soft underfeathers of the goose, mixed with duck feathers works as a natural padding for sofas, but it can be expensive. It also has a tendency to clump. Regardless of the filling use in the sofa, the padding needs a good suspension system of webbing to help keep it in place. Serpentine springs and hand-tied springs are the two most common suspension systems in higher-end sofas. The hand-tied springs often last longer and are more comfortable. If the sofa squeaks when you sit on the outside edge, the springs may not be heavy enough to provide long-lasting comfort. Sofa upholstery needs to be comfortable to the touch. 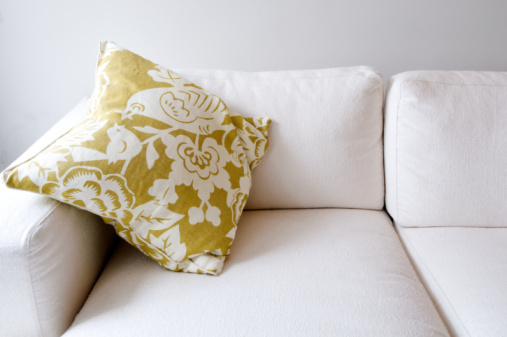 If you plan to catch a nap on the sofa on a regular basis, look for sofa upholstery that is easy to clean and smooth to the touch. Tweeds and rougher fabrics may feel scratchy against bare skin. Try out any features offered on a sofa before you buy it. Engage the recliner; the mechanism that raises the legs and allows you to recline should operate smoothly and easily. The footrest should allow the seat to go back into the upright position easily and effortlessly. Check out the chaise seat as well, if the sofa has one. Put your feet up and see if the seat is comfortable. Flip down any consoles and armrests to see if they are at a comfortable level.